1 hour Aquaduck city and river tour. Departing from the heart of Surfers Paradise, tours aboard the amphibious ‘Aquaduck’ combine an informative city-tour with a unique and exciting river-cruise. Enjoy a 1 hour Aquaduck city and river tour. 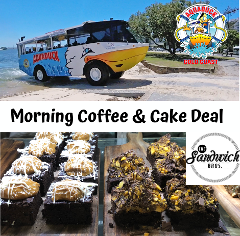 Departing from the heart of Surfers Paradise, tours aboard the amphibious ‘Aquaduck’. 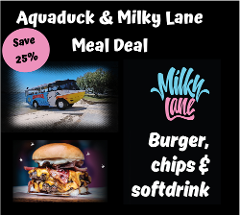 Then head next door to the famous Milky Lane for a meal which includes a mouthwatering Burger, Fries & Drink.